My newest painting has now buzzed into my Etsy shop and I think she’s my favorite girl yet. 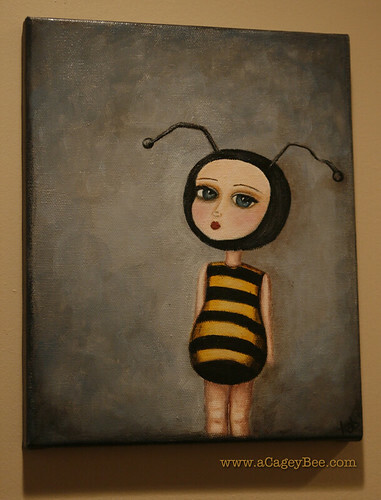 With Halloween quickly approaching, The Bee Girl is sort of fitting though I think with her big blue eyes and soft, rounded belly she’ll be a welcome addition to my studio/bedroom/office all year round. Speaking of Halloween, what are *you* going as this year? I went as Little Red Riding Hood last year and had a blast dancing up a storm with a cowardly lion, otherwise known as my girlfriend, Jen. (Hi Jen!) We even got John into the spirit and had him on the dance floor until the wee hours of the night. This year will be a little different as I’m hoping my sister will be up from Seattle with her two little boys. As much as I adore dancing, holidays like Halloween are always more fun with wee ones to share it. Now what am I going to wear? Next postDrift Down Main St.